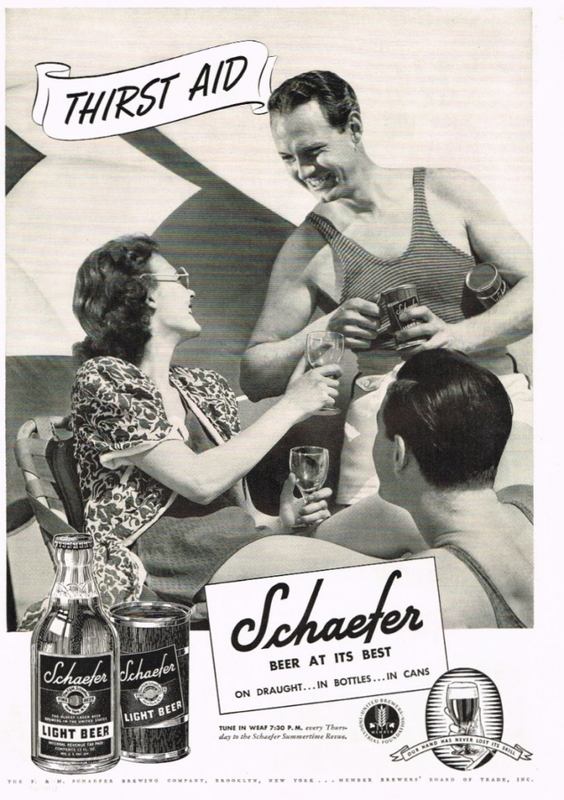 Tuesday’s ad is for Schaefer Beer, “first produced in New York City during 1842 by the F. & M. Schaefer Brewing Company.” This ad, from 1938, features a scene poolside or at the beach, with a woman surrounded by two men in tank tops serving her Schaefer beer, with smiles all around. Historic Beer Birthday: William Hamm, Jr.
Today is the birthday of William Hamm, Jr. (September 4, 1893-August 20, 1970). He was born in Minnesota, and was the grandson of Theodore Hamm, who founded Hamm’s Brewery in St. Paul, Minnesota. He was also the son of William Hamm Sr., who took over for his father when Theodore retired and ran it until he died shortly before prohibition was repealed, when his son William Jr. took over. 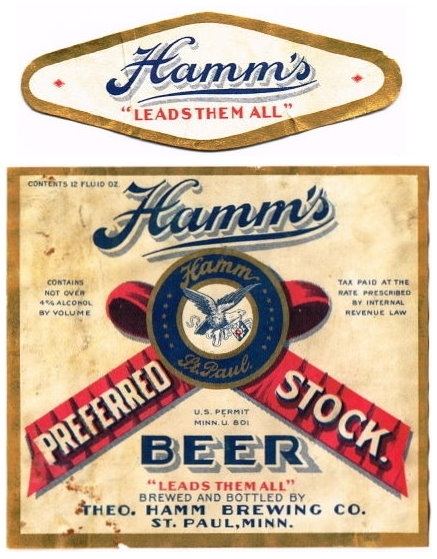 William Hamm, Jr., was the grandson of Theodore Hamm, founder of the Hamms Brewery. William Jr. inherited the Chairmanship of the company from his father. In 1933, William Junior was kidnapped by the Barker-Karpis Gang as he walked home for lunch. Hamm was released after 3 days in exchange for a $100,000 ransom. The Theodore Hamm Brewing Company was established in 1865 when, a German immigrant Theodore Hamm (1825-1903) inherited the Excelsior Brewery from his friend and business associate A. F. Keller, who had perished in California seeking his fortune in the gold fields. 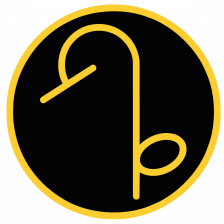 Unable to finance the venture himself, Keller had entered into a partnership with Hamm to secure funding. Upon Keller’s death, Hamm inherited the small brewery and flour mill in the east side wilderness of St. Paul, Minnesota. Keller had constructed his brewery in 1860 over artesian wells in a section of the Phalen Creek valley in St. Paul known as Swede Hollow. Hamm, a butcher by trade and local salon owner, first hired Jacob Schmidt as a brew master. Jacob Schmidt remained with the company until the early 1880s, becoming a close family friend of the Hamms. Jacob Schmidt left the company after an argument ensued over Louise Hamm’s disciplinary actions to Schmidt’s daughter, Marie. By 1884, Schmidt was a partner at the North Star Brewery not far from Hamm’s brewery. By 1899 he had established his own brewery on the site of the former Stalhmann Brewery site. 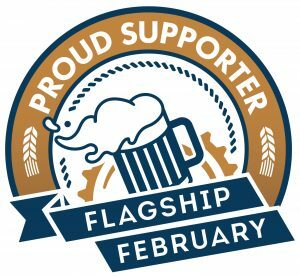 In need of a new brewmaster, Hamm hired Christopher Figge who would start a tradition of three generations of Hamm’s Brewmasters, with his son William and grandson William II taking the position. 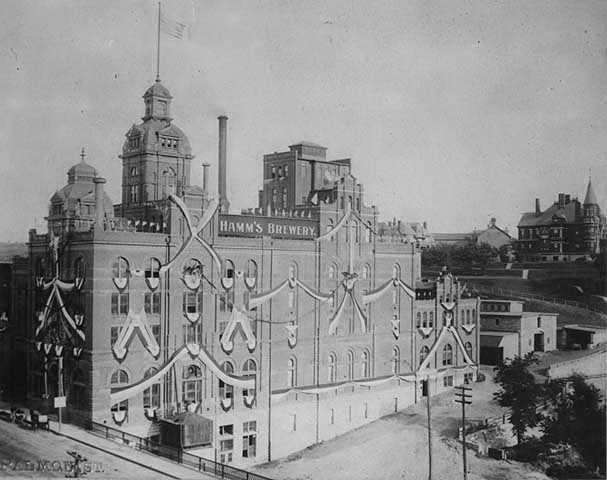 By the 1880s, the Theodore Hamm Brewing Company was reportedly the second largest in Minnesota. Unfortunately, he’s perhaps best known not for having successfully run his family’s brewery, but for an incident that occurred in June of 1933. While he was walking home for lunch on that summer day, he was kidnapped by the Barker-Karpis gang and held for a $100,000 (which is over $1.8 million in today’s dollars). The family paid the money two days later, and he was released, but the crime reverberated beyond Saint Paul and became a national story. Up until that time, the Minnesota city was corrupt and allowed gangsters and criminals to stay in the city, even finding them lodgings and women, as long as they promised to behave within the city limits. But the kidnapping broke that bargain, and within a year most of the cities corrupt police and officials had either resigned or were facing jail time. You can read more about it in “A Hamm’s ransom: How the kidnapping of one of St. Paul’s most prosperous brewers reshaped a corrupt system,” “Abducted in St. Paul!” or read accounts from the time in Read All About 1933. 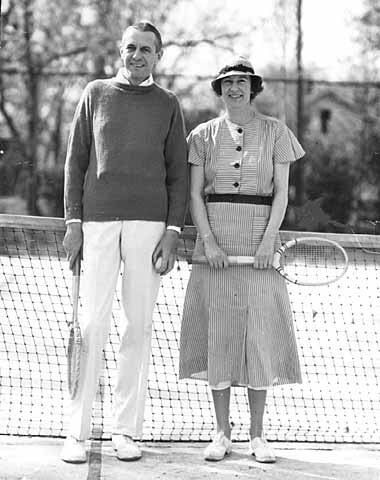 William Jr. and his wife Marie Hersey Hamm. 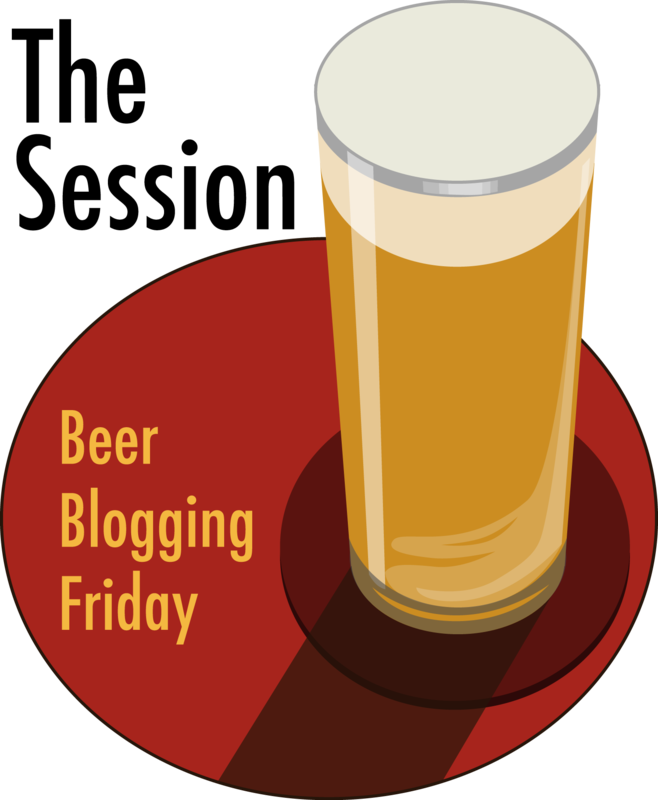 Today is the birthday of fellow Bay Area beer writer Ken Weaver, who’s a neighbor in the next town over. If I’ve done my math correctly, today is his 37th birthday. Ken used to work for Rate Beer, and until recently was also on the staff of All About Beer magazine. 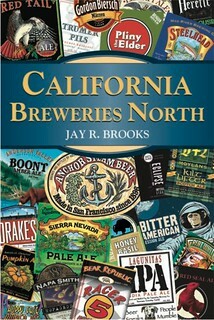 He also wrote The Northern California Craft Beer Guide, with photographs by his lovely wife Anneliese Schmidt. Believe it or not, Ken has a degree in physics from Cornell but chucked it all to follow his heart and preference for writing and good beer. Physics’ loss is beer’s gain. Join me in wishing Ken a very happy birthday. 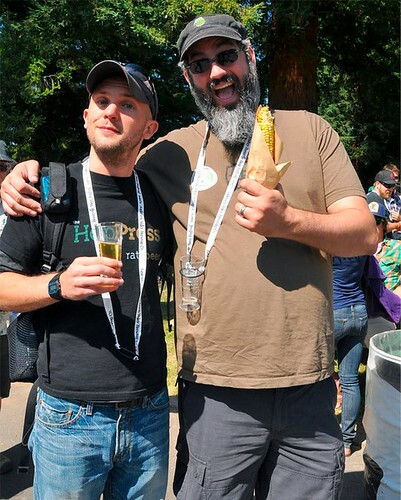 Ken and Sean Paxton at the Boonville Beer Festival in 2010 (purloined from Facebook). 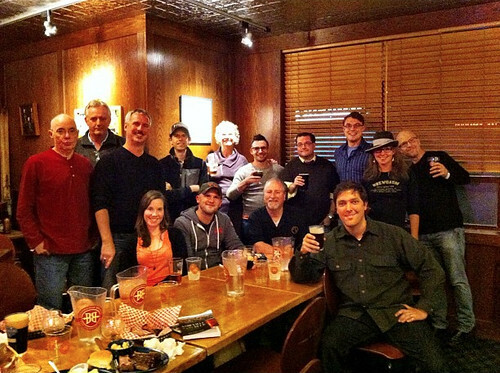 At a North American Guild of Beer Writers meet-up at Breckenridge Brewing during GABF 2012, with Ken and me, dead center. 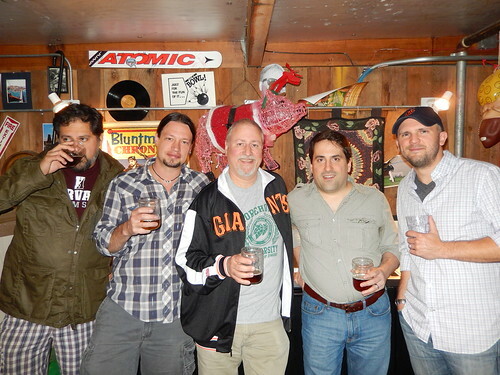 At Lagunitas for Tom Acitelli’s book release party a few years ago, with Joe Tucker, Jeremy Marshall, me, Tom and Ken. 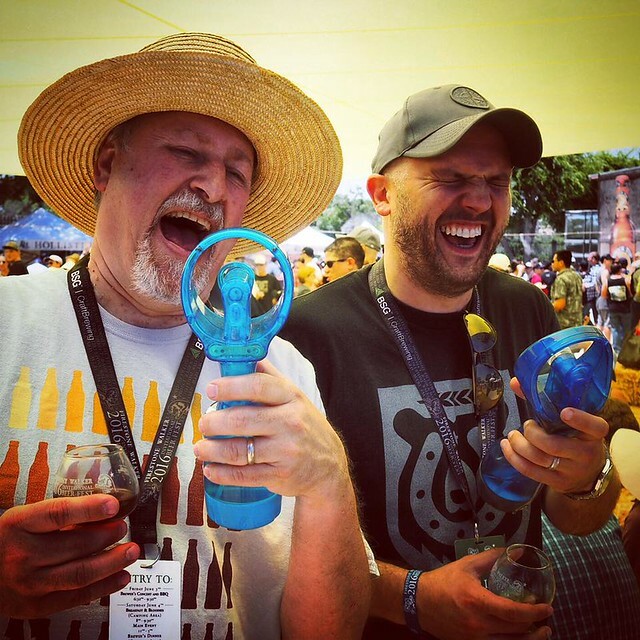 My new favorite photo of Ken, at the Firestone Walker Invitational last year. Today is the birthday of Samuel Simon Loeb (September 4, 1862-January 22, 1947). 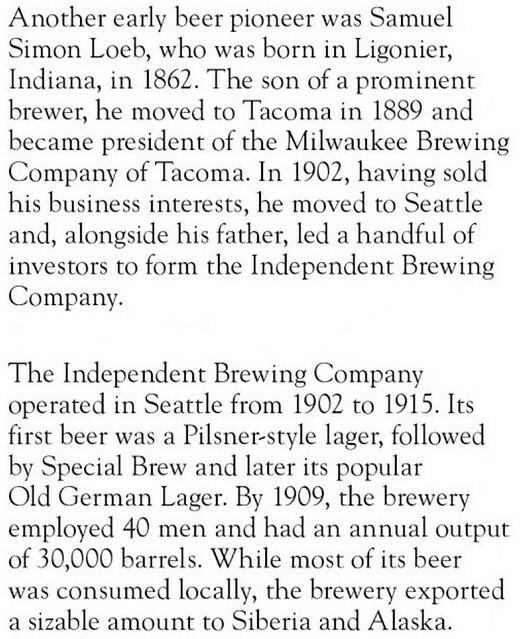 He was born in Indiana, but settled in Tacoma, Washington as a young man, and was involved in several area breweries there, first the Milwaukee Brewery (which merged to form the Pacific Brewing & Malting Company) and then the Independent Brewery, before being bought by the Seattle Brewing & Malting Co. After his brewery was acquired, Loeb remained in charge, and after retiring, he and his wife moved to Los Angeles. S. S. Loeb is president of the Milwaukee Brewing Company of Tacoma, incorporated with a capital stock of $35,000, all paid up. The present officers of the company are S. S. Loeb, president, and A. Weinberg, secretary and treasurer. The brewery was formerly called the United States Brewery, and was organized by D. Stegman and M. Karcsecte. The latter sold out to John Frazier, who continued in the business till May, 1891, when the present firm bought out the concern, reincorporated and formed the Milwaukee Brewing Company. The plant was a small one when they first bought it, the output being only forty-two barrels per day. The capacity has been increased until it is now 125 barrels per day. Their trade extends throughout the Sound country. Mr. Loeb, the president, was born in Ligonier, Indiana, on the 4th of September, 1862. He was the son of Simon Loeb, who was a prominent brewer. The subject of this sketch was reared in Chicago, where he went when a child. 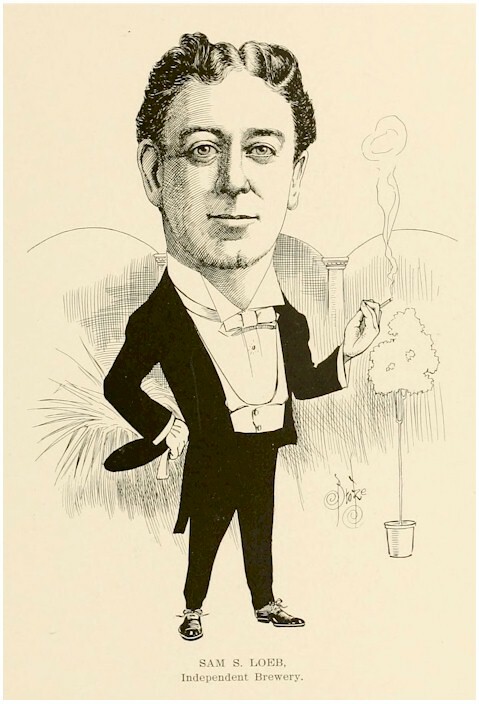 He became concerned in the cigar business with Ruhe Bros. (Allentown, Pennsylvania, and Chicago), and later traveled for the same firm, with whom he continued for four years. He then worked four years for Schloss, Ochs & Co., wholesale gentlemen’s furnishers. In 1889 he came to Tacoma and engaged in the wholesale liquor business, which he continued for three years, when he closed out that business, and has since given his attention to the brewing business. Mr. Loeb was married November 18, 1890, to Miss Blanch Moses, a native of Gallipolis, Ohio. They have one child, Sidney. In 1897, four years after the foregoing was written, Samuel sold the Milwaukee Brewery and merged it with the Anton Huth’s Puget Sound Brewery, forming a new enterprise – the Pacific Brewing & Malting Company. In 1899, Pacific purchased the Donau Brewery and closed the Milwaukee plant. 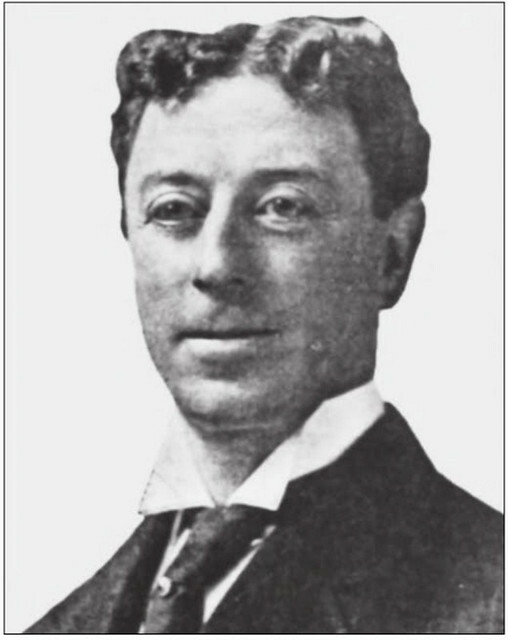 Loeb continued with his other business interests in Tacoma, as well as holding a minority interest in Pacific. As late as 1901 he was still secretary of the company. But by 1902 he and his partners from the Milwaukee Brewery decided to actively re-enter the brewing business. They organized an investment company to build a brewery in Seattle. They named the new venture the Independent Brewing Co. By mid-September of ’02, construction was well underway when a fire broke out. Despite the efforts of the Rainier Volunteer Fire Brigade it could not be contained and the frame structure burned to the ground. While this was a major setback the investors regrouped and the plant was rebuilt. By early 1904 they were in production and that October the investors incorporated the company. 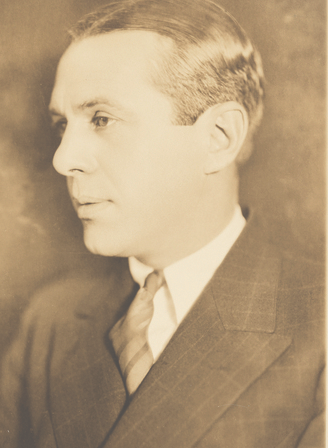 The principals in the new company were Samuel Loeb, Herman Klaber, and Benjamin Moyses. 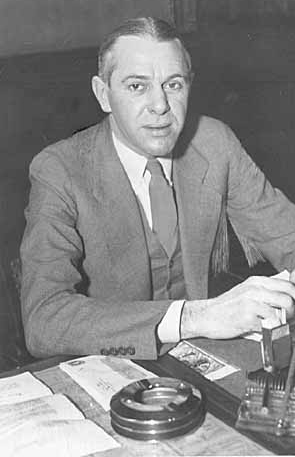 Albert Weinberg, Samuel’s brother-in-law, was also a part of the company, just as he had been in the Milwaukee Brewery. 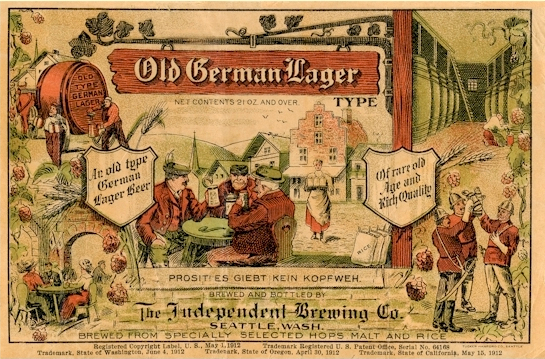 The brewery flourished in spite of the major competition with Seattle Brewing & Malting’s popular “Rainier Beer.” But Loeb’s “Old German Lager” was well received in the Seattle area and even found a market in San Francisco. By now, Samuel’s numerous enterprises and real estate holdings had made him a millionaire. A cartoon from a 1905 Seattle publication (below) reflects the image that Samuel projected. In 1906, the Seattle Brewing & Malting Co., purchased controlling interest in Samuel Loeb’s brewery, but he remained in the management position. 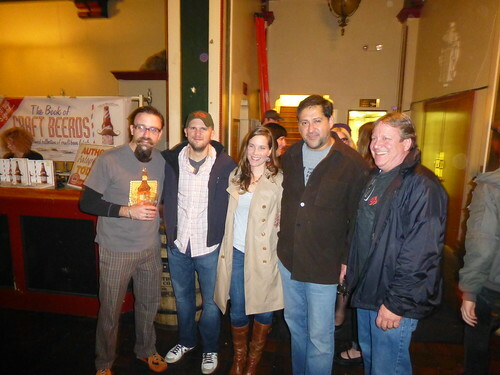 The brewery had become second in sales behind SB&M so became a target for the takeover. The Loebs decided to build a home in keeping with their wealth and social status. They erected an imposing Tudor Revival, brick and half-timbered Mansion on Millionaires’ Row. It was completed in 1914 but as it turned out, they would not be able to enjoy their new home¹. 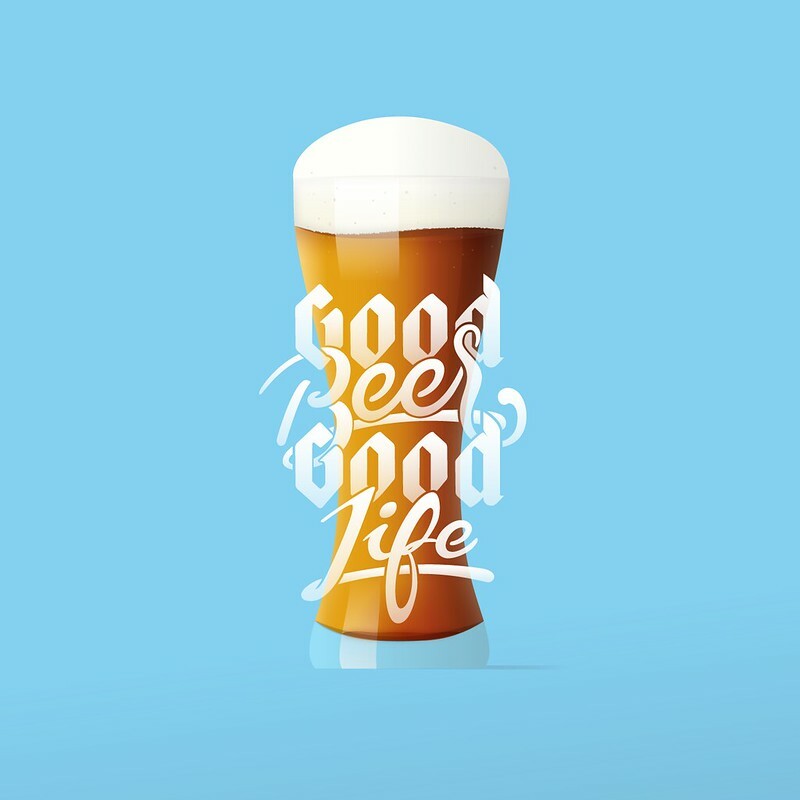 While the brewing business was booming, it was not to last. In November of 1914, state-wide prohibition was approved by the voters, to take effect January 1, 1916, giving the brewers one year to dispose of their stock and cease production. 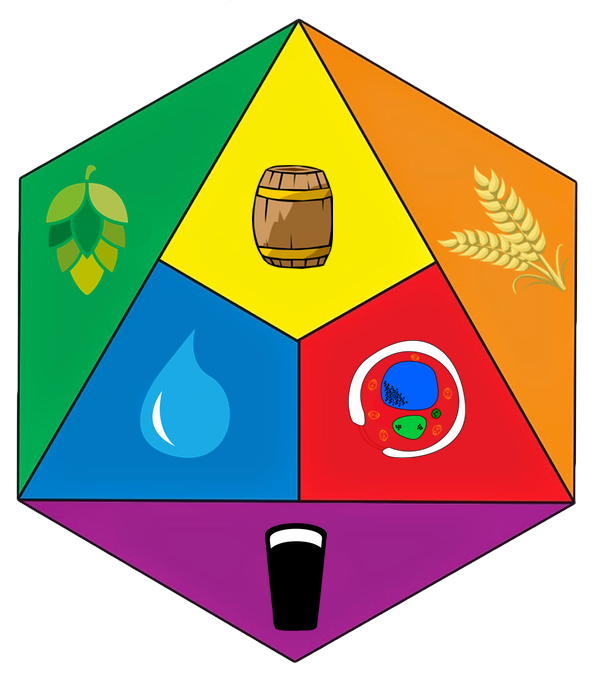 Some attempted to shift production to other products, but Samuel chose to close his Independent Brewery. 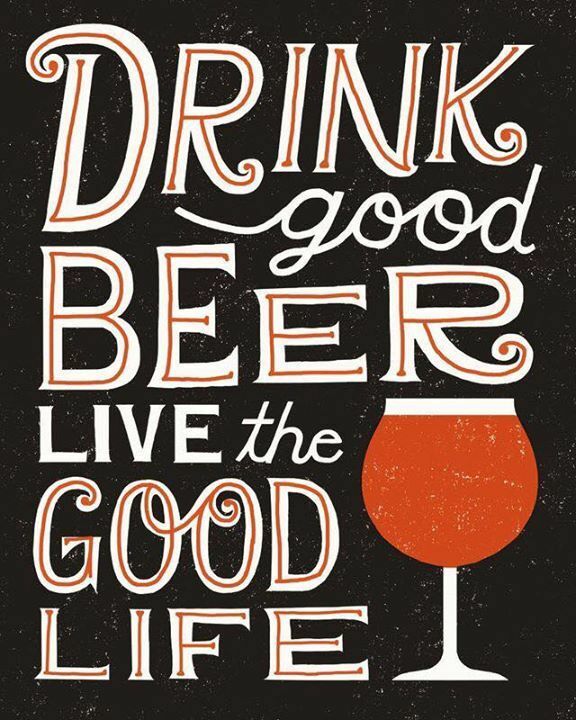 Loeb decided to relocate to San Francisco, as did the parent company, Seattle Brewing & Malting, in the belief that Prohibition would never be approved nationally. A new Rainier plant was built, but Samuel decided to skip the production phase in favor of marketing his beer. 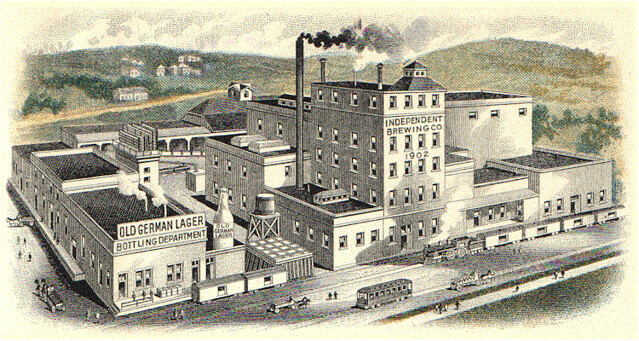 In 1915, the Old German Lager Brewing Co. was in business. Loeb contracted for the brewing and bottling of his “Old German Lager,” a beer already familiar to San Franciscans. He was assisted by his son, Sidney, who served as the company’s vice-president, while Samuel assumed the position of president. By 1918 Loeb dropped the word “German” from the firm’s name, no doubt due to the anti-German sentiment from the war in Europe. So it was now the Old Lager Brewing Co., and their beer became “Old Original Lager” but with an identical brown label. Of course national Prohibition was voted in, and to keep their plants operating many brewers shifted production to either soft drinks or near-beer. Samuel chose the later. He struggled along with this product for four years, but in 1924 he closed the business for good. 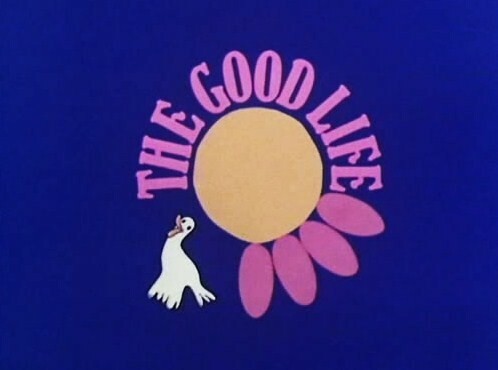 Samuel retired, and he and Blanche moved to the warmer climes of Los Angeles, where Samuel became a real estate broker. On 22 January, 1947, Samuel Simon Loeb died at the age of 85.